Successive Golden Rectangles dividing a Golden Rectangle into squares (An engraving of the Statue of Zeus made by Philippe Galle in 1572). 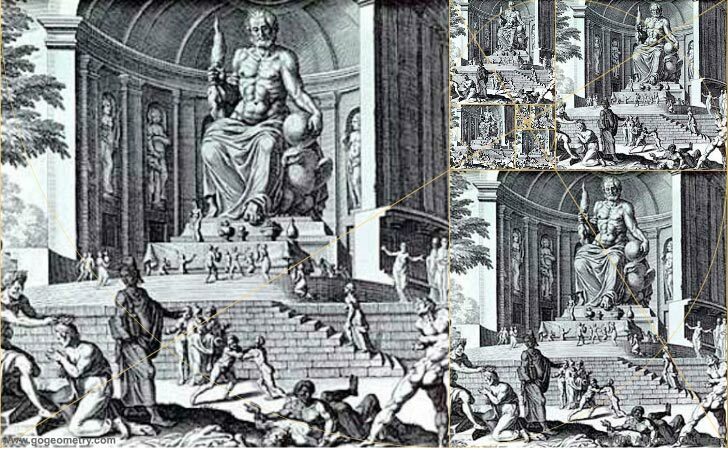 The Statue of Zeus at Olympia was one of the classic Seven Wonders of the Ancient World. It was made by the famed Greek sculptor of the Classical period, Phidias, circa 432 BC on the site where it was erected in the temple of Zeus, Olympia, Greece. Source: Wikipedia: Statue of Zeus at Olympia.